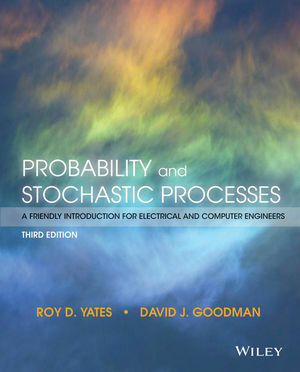 This text introduces engineering students to probability theory and stochastic processes. Along with thorough mathematical development of the subject, the book presents intuitive explanations of key points in order to give students the insights they need to apply math to practical engineering problems. The first five chapters contain the core material that is essential to any introductory course. In one-semester undergraduate courses, instructors can select material from the remaining chapters to meet their individual goals. Graduate courses can cover all chapters in one semester. Roy Yates received the B.S.E. degree in 1983 from Princeton and the S.M. and Ph.D. degrees in 1986 and 1990 from MIT, all in Electrical Engineering. Since 1990, he has been with the Wireless Information Networks Laboratory (WINLAB) and the ECE department at Rutgers University. Presently, he is an Associate Director of WINLAB and a Professor in the ECE Dept. He is a co-author (with David Goodman) of the text Probability and Stochastic Processes: A Friendly Introduction for Electrical and Computer Engineers published by John Wiley and Sons. He is a co-recipient (with Christopher Rose and Sennur Ulukus) of the 2003 IEEE Marconi Prize Paper Award in Wireless Communications. His research interests include power control, interference suppression and spectrum regulation for wireless systems. Material reorganized and expanded based on authors' teaching experience and feedback from students and instructors. New chapters on Sequential Trials, Derived Random Variables and Conditional Probability Models. Solutions manual includes step-by-step solutions. More than 160 new homework problems. Advanced material on Signal Processing and Markov has been posted online. Student-friendly narrative aids intuitive understanding of real-world principles underlying mathematical concepts. Motivates engineering students who often perceive the subject as abstract and irrelevant to their practical interests. MATLAB applications encourage students to gain hands-on experience with material presented in the text. Instructors have access to program files provided by the authors and do not need to create and debug their own code. Extensive collection of exercises (examples, quizzes, and homework problems) assists students with the most difficult part of learning probability—going from theory to practical applications. The degree of difficulty of each homework problem is clearly labeled. Separate treatment of discrete and continuous random variables. Students, especially those encountering this material for the first time, can learn basic principles without the confusion of two different ways of calculating probabilities and averages (sums and integrals). Seeing the same principles twice reinforces the learning experience. Online support for instructors, including solutions to homework problems. A graphical interface enables instructors to generate customized solutions handouts and offers flexibility in the way homework problems are used. Saves instructor time in solving exercises and preparing information for students.